Making way: Singh says his tenure as BJP president is almost over. 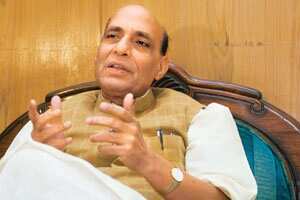 New Delhi: The Bharatiya Janata Party’s (BJP) president Rajnath Singh hinted at an earlier-than-expected end to his term—a move that indicated both to the extent of the turmoil in the party that has had no reason for cheer in the past few months and to the strengthening of ideological parent the Rashtriya Swayamsevak Sangh’s (RSS) hold over the party. A political analyst also saw in Singh’s hints a message to the party’s leader and leader of the Opposition, L.K. Advani, asking him to quit as well. Talking to reporters on Tuesday, Singh, 58, said: “I have almost completed my tenure. A new president has to take over..., the efforts should be to complete the process (election of the new president) at the earliest... I have conveyed my wish (to quit) to others in the party." Advani, 82, was projected as the prime ministerial candidate of the BJP-led National Democratic Alliance combine in parliamentary elections held earlier this year, where it fared badly. Since then, the RSS has sought to overhaul the top leadership of the party, although its public position has been that there “is no deadline for Advani to quit". Two central office bearers of the party said when contacted that in a recent meeting with RSS chief Mohan Bhagwat, Singh had conveyed his desire to quit “at the earliest" and insisted that “the new president should be given caretaker charge even if the organizational polls are not completed on time by December-end". Singh will likely be replaced by Maharashtra BJP chief Nitin Gadkari. As for Advani, it is almost certain that “deputy leader in the Lok Sabha Sushma Swaraj" will replace him and senior party leaders “have been conveyed" this, said a senior BJP leader who did not want to be identified. Bhagwat had, in a recent interview, ruled out the candidature of four senior BJP leaders—Swaraj, Arun Jaitley, M. Venkaiah Naidu and Ananth Kumar—known to be close to Advani,?for the president’s post and said that it was time for “young leaders" to take up responsibilities within the party. Gadkari is 52 years old. Kumar, the youngest of the four BJP leaders, is 50 years old, and Naidu, the oldest, is 60. Singh, a former chief minister of Uttar Pradesh, took over as caretaker president of the party on 26 November 2005. He was named president on 31 December the same year. His three-year tenure and the one-year leftover tenure of former party president Naidu ends this year, and Singh has been insisting that he be relieved by the end of the month. As per the organizational poll schedule, the party’s returning officer for the elections Thawarchand Gehlot said, the state-level elections (of at least 50% state units) will finish by 15 December and the next level of central elections could take another fortnight. Singh’s move is also seen by the analyst as an attempt to lengthen his political career. “He is clearly trying to earn brownie points with the RSS bosses. He also wishes a regime without Advani’s influence," added Chenoy. Singh said he was open to any role. “I am a dedicated worker of the party."